If you’ve been following my page for the last year, you will have seen at least a half dozen posts mentioning the Zumspot. It’s pretty much taken the digital amateur radio community by storm over the last year or so. I picked one up from HRO in Dayton/Xenia last year, had it up and on the air in a matter of a half hour or so – in fact it takes longer to assemble the case to put it in. For those unfamiliar, the Zumspot is a board that’s about the size of a stick of gum, it’s designed to work the the Raspberry Pi (the kits even come with a Raspberry Pi Zero to use it with). The point of the Hotspot is to get you up and on the commonly used digital voice modes even in areas with no repeater coverage. They cover D-Star, DMR, C4FM (or Yaesu System Fusion), P25, and NXDN. In a lot of areas there is no coverage of any of these modes, less all of them, so for someone interested in trying them out, but not crazy about the idea of building up a whole repeater just to play around with the mode, these are a very cost effective method of getting into the mode, starting off at around $140 from Ham Radio Outlet for the whole Kit. It fundamentally works by receiving your RF signal in whichever digital mode/modes you choose, and transmitting it via the internet to the desired Reflector/TalkGroup/Room you choose. A lot of people I know that have these have had the occasional hiccup with setup, or memory programming – I can sympathize with that as when I started this, I think I played around with the software for hours before it finally worked. Admittedly I’m unsure if the board even works with other software, as these boards all come with a memory card preloaded with the Pi-Star software, however having used other software such as Western Digital’s with other hotspots, I will say that Pi-Star is a much more straight forward, user friendly interface that, for the average user with no past experience with this type of thing, is pretty much just the way to go in the current digital radio landscape. It will bring you to the screen below – it provides good instructions on what to do from here. You enter your Wifi information in the circled area, and it will generate a WiFi configuration file that we will the drag and drop on to our Pi-Star memory card, and get the device up and running! Let’s locate the file that we’ve created (should be in your downloads folder), we’ll drag and drop that into the SD Card that has our Pi-Star OS on it. For this piece simply follow the onscreen instructions, this is very well documented and easy to setup. The first thing you’ll want to do before setting at configurations is fetching an update for the latest Pi-Star software, this will have any types of stability patches, security updates, etc.., so make sure you click the “update” tab along the top bar. It’ll run its course and reboot. This is where the confusion comes in – what type of software are we having Pi-Star act as? MMDVMHost or a D-Star Repeater? Well, this I guess is only confusing for those that are D-Star ONLY users, but even if you’re using it exclusively for D-Star, you need to select MMDVMHost. Below you’ll see the MMDVMHost menu, and it’s here that you select what modes you’ll be using – I use YSF (Fusion/C4FM), D-Star, and DMR, so I have all of those selected as active as you’ll see, and then click apply changes. Next, you’ll input your Callsign, as this is what the node will need to be assigned to be able to transmit over the gateway, and your CCS7 (or DMR) ID. This post is assuming that you have both registered your call, and gotten a CCS7/DMR ID, if you have not locate your closest D-Star Repeater and see if they’re setup for callsign registration, and go to http://www.dmr-marc.net/ to obtain your CCS7 number. After that you’ll pick a frequency – BE SURE YOU’RE IN AN OFF SECTION OF THE BAND! Last thing you want to do is be in the middle of the satellite downlinks or something, and mess with someone’s Sat. contact. If you’re interested in utilizing DPRS to transmit your location with each transmission, as well as mark the location of your hotspot, you’ll enter the latitude, and longitude of your hotspot, and the location data it asks for below. In order for it to communicate effectively with the Pi, as well as to identify what you’re using over the gateway, select the drop-down menu for “radio/modem type,” and select your corresponding hotspot setup (as you’ll see mine is the Zumspot/Pi-Zero). Another thing to note in the photo below is that each mode is already configured. When you check the various boxes for the particular modes after your information is in, there isn’t a whole lot else to be done. With DMR, specify that you’d like to utilize the gateway, and enable the brandmeister network, and you’re pretty much good to go. For D-Star you can choose a default reflector to link to on startup if you’d like, or if you don’t want to have it automatically link, just leave it where it’ll default to – should say REF001A and the manual box will be checked, meaning you have to tell it to link to the reflector. With Fusion, you just select a room to link to, and you’re done. Click Apply Changes, and now, we’re ready to use it! When you save your settings, it should automatically reboot, you’ll lose your connection to the device for about 30 seconds to a minute, and then you’ll be back up and running, and ready to go! Now, it’s time to move on to the radio side..
With D-Star the memory functions can be a little tricky, and while this is likely the most functional mode of all the commonly used ones today, the initial programming with an Access Point is a little tricky – the thing to remember is that we need to treat a hotspot just like a repeater, down to programming with an offset and everything. The kicker is that there is NO offset, so we have to remember to set the frequency shift to +/- 0.00 MHz. If you don’t do this, your memory will be tagged as skip, meaning any time you rotate the dial to access the memory, it will be skipped over in the repeater list. As follows are the step by step instructions for programming the Kenwood D-74. Other radios such as the Icom ID-31/51/5100/7100 all use very similar memory functions, the key point to remember with all of these radio’s is to set that +/- 0.00 MHz offset, otherwise it will not work with any radio. Choose Write, and you’re all set! You’re on D-Star via Hotspot! Programming your DMR HT is very straight forward – all that has to be done is presetting a memory bank for the Hotspot, and programming each Talk Group you’ll likely use in a separate channel. Set the TX/RX to the same frequency in the memory channels, and vary each one for each talk group. With the hotspot, while you can program an “unlink” command, it is not necessary unless you plan on just utilizing as a simplex repeater, every time you key up a new talk group, the Hotspot unlinks from the previous group, and links to the new one automatically. Below are step by step instructions for programming the CS-580 (BFXD HT), your mileage may vary as I only have DMR experience with this radio, and I’m unaware of how the software for the TYT MD-380, or Hytera radio’s works in comparison. All other data can remain as is. Apply your changes, and reboot, and you’re up and on the air with DMR! Admittedly my experience with fusion at this moment is limited to dashboard control, and the little FT-70D, however having just gotten an FTM-400 I hope to change that soon. Fusion can be linked to rooms through direct input or dashboard, however up until recently the FT-70 did not support direct input. Programming is very simple however, be sure that your callsign is programmed into the radio, set the frequency for the Hotspot in your memory as a simplex frequency, and set the mode to digital. Write the memory, and you’re good to go! For the most part that is, from the Admin page on the Pi-Star dashboard you can change the room you’re linked to, and find out what room is which assigned number. When you know the corresponding numbers, you can program those into your radio, or directly input them to link to those rooms. If anybody has more information on programming radios for Hotspot use with C4FM, please feel free to comment. Write it to memory by pressing F followed by V/M, press it again and type out what you’d like to name the channel, and press again to write, and you’re on the air on the Hotspot with Fusion! I hope that this has been an informative post, and can be used as a tool for you in the future! And to make it easy to access in the future this will be a permanent link in the menu bar – this will remain a fluid post updated as new information comes along, but for the moment this is as up to date as can be! It’s the largest contest of the year! The one with the most activity in North America at least. Though it being a contest isn’t what it’s all about. Field Day is meant to be an exercise in emergency preparation, and it’s a great exercise in communication, cooperation, and knowing what you can do in a pinch. In the last 4 years, we in Genesee County, NY have resurrected a club. While we have a small membership, we all meet the third Friday of each month and discuss amateur radio related events, and topics. Of course our meeting in June, which was a week before Field Day, was related to preparations we were making to ensure that we were ready to be on the air at 2pm kickoff of Amateur Radio’s biggest day in our neck of the woods. Our station setup was at the Genesee Community College in Batavia, NY. Great vantage point for VHF/UHF communications (which never fully got on the air), as well as plenty of trees for us to run our dipoles, and couple of beams that we had. We operated as 3A, and we had our VHF station as well, in the night hours/wee hours of the morning, our transmitters went from utilizing all bands possible, to two of us being on the air, one running 40m CW, and myself running 80m Voice. At 2:30am, I was working my way through a pileup on 80m Voice, which is a little different for me. I don’t usually call CQ at night, I usually Search and Pounce, but with that being said I thought about how many other people out there are doing the same thing… somebody out there has to be the one calling! Our setup was pretty much the same as last year, however working with the new location had a few perks – last year being our first as the “new” club, we were in search for a spot for a while, however we were able to use the Genesee County Fairgrounds, which worked great! Up until Saturday evening, when the racetrack nearby started up, and suddenly everyone had to slap on headphones. We had three motorhomes on site, two of which ran stations, one running an Icom IC-7100, and the other running a Yaesu FT-991. In addition, there were two large tents (one is on the other side of the GMC motorhome), one of which also had a 991 setup, and the other contained our VHF station running an Icom IC-9100. In the middle of the site (under the orange popup) was our little Honda generator which was more than enough to power all of the stations with no problem. For HF antennas we ran an 80m OCF, and a 40m Dipole, as well as a RadioWavz Scout, which is good on 10-40. For VHF, we ran a stack of Moxons for 6/2/220, and for 440/900 we had a few beams, however I won’t go into detail for those, as we never got VHF on the air beyond 6m. We were able to achieve a couple of bonuses, the first being contacts off of an alternative power source, which we were able to do using a solar charged battery. The second was by making a satellite contact, we were unable to get the initial contact on AO-92, however an hour after that attempt we were able to make a contact on AO-91 (video to come later, still needs to be taken off camera). All in all we stepped up our game from last year, I haven’t compared our overall contact difference, but I believe that we were able to improve upon last year for sure. We had a few new licensees that we were able to get on the air with, and allow them to experience more than 10m on HF. In addition, though it was nothing like the VHF contest, we did have a small 6m opening to the South, and intermittently to the West, on Sunday morning, allowing us to work Kansas, Nebraska, Florida, Alabama, and Georgia. I am a little bitter about how many stations simply flocked to 50.313, and solely used FT-8. With how open that band was – in and out, yes, but still open – there should have been more activity than there was. We stepped up our game from last year, there are some improvements to be made going into next year in regards to station setup, software we want to run, etc., so I guess that means it’s time to start prepping for next year! If you’ve talked to me at all about computers, you know that I love these things. Or if you read my previous post about DV hotspots in Amateur Radio, you must have noticed that I mentioned a device called a Raspberry Pi. In the post I discussed the Pi Zero briefly. Today I just want to quickly go over what a Raspberry Pi is, and why you should have at least one if you want to play around with any technological concepts. Pictured on the left is a model B+ of the original Raspberry Pi board, and on the right is the more recent Raspberry Pi 3 B board. The Raspberry Pi is a credit card sized computer. It has a handful of ports – 4 USB, 1 Ethernet, 3.5mm Stereo, HDMI, Micro USB (for power), Micro SD card slot for storage, 2 ribbon cable slots on the board (1 for camera, and 1 for a display), as well as a 20 pin GPIO. They upgrade the memory on them between releases, and the Pi 3 is a lot more powerful than the original Pi was for sure, in addition they now have built in WiFi and Bluetooth where as before you had to get a USB device to have the capability. In addition, via the ribbon cable port you are able to convert it into the functioning touchscreen computer below. What purpose does this serve really though? Why should you want one of these? There are a few things that can be done with these for sure – I have primarily used them in radio applications for running hotspots, and logging, however I am in the process of building a media server off of one as well (been a long process, just need to pull the trigger on some storage, and it’s ready), which will allow me to have the entirety of my music, photos, and movies stored on it, and will make it accessible from anywhere. Pretty neat, right? All off of a board that’s the size of a credit card. You can tie them in for home automation, security systems via the camera port, media center boxes, and any hardware tinkering you want to do, you can fiddle around with the GPIO – check out the people that have built robots and drones with these, they’re really cool. They’re a sandbox for technological play – pretty much any concept that you have you can probably fill in with one of these. In addition to the Pi, there is the Pi Zero that I mentioned in a prior post. That is a board only slightly larger than the size of a stick of gum. It has 2 micro USB ports, one micro HDMI, a ribbon cable port for a camera, and an SD card slot. That is it. I don’t have any photos, but you can check them out here. This I haven’t really played around with too much, but it’s a slimmed down, bare bones version of the Pi, meant for you to be able to play around with for single uses. What’s Next? – How about a little digital talk? Field day is but a week and a half away at this point, and my radio is setup as one of the main stations, and as I live in a smaller apartment space, setting up, and breaking down is a process the way I have everything wound up, so I will not be on the air for another couple of weeks… from home at least, I always have the mobile. And I guess I should specify on the air for sideband – I do operate the currently dominant digital protocols as well, so I’ll be on D-Star, Fusion, and DMR. On the note of digital, why don’t we discuss a little device that has become the be-all, end-all of digital hotspots, the ZumSpot. For those of you that don’t know, the digital protocols that most all major radio manufacturers produce at least one radio for now are pretty reliant on the internet when it comes to their extended features. Sure, you can talk D-Star, or DMR simplex, and you can use the repeaters locally if there are other people in your area with the ability to use them, but where’s the fun in that? With the infrastructure that’s out there, we can talk all around the world! I picked one of these little guys up in Dayton this year. It’s a small, single band (70cm) MMDVM (Multi-Mode Digital Voice Modem) board that you use in conjunction with a raspberry pi computer. It attaches right to the GPIO, you screw on an antenna to the SMA connector, and after setup of the software, you’re good to go! They’re powered simply via the Pi through the GPIO, so you have no additional power concerns. In the above photo I am powering it through a PowerFilm Solar phone charger. With this battery bank at a 50% charge or so when I plugged it in, I had around 7 hours of usage of the ZumSpot, only about 30 minutes of talk time, however the remainder was receive time. You can purchase it as a kit for $129.95 from HRO, that includes the hotspot, a raspberry pi zero, and a small SMA rubber duck antenna to attach to the board. I will warn you that this doesn’t come with a case, there is a case available for purchase, it’s a real pain to put together, but it works for sure, and I would highly recommend putting something on it so you don’t just have open circuit boards laying around. It is the most all inclusive hotspot produced to date, it covers the big 3, as well as P25, and NXDN, with support for running cross modes if you can figure out how to set it up. I am no expert. By any means. It took me close to 12 hours of playing around with this to realize that when I changed my call, I never reconfigured by D-Star registration correctly. That was in December, it’s now May at this point – just goes to show how little I use the D-Plus reflectors. After I finally get all of this configured it works perfectly. I have been using it on and off, bringing it with me tethered to a cell phone for internet service, linked to the DCS006B reflector. I’m not going to go through the details of setup here, I may make another post about that, however it’s straight forward. If you have any interest in these modes, this is one of the cheapest ways to get into it. If you feel like putting together a repeater to play with the mode, go for it, but if you just want something small, cheap, not needing tons of equipment that’s going to require a second mortgage to get running, you can get one of these boards, and the entry level radio for one of the modes – I’d suggest the Icom ID-31 for D-Star, the Yaesu FT-70 for Fusion, and the TYT MD-380 for DMR (only because of the users groups and assistance that can be given), and still get out for under $400 – especially if you catch the radio’s when there is a manufacturer rebate. Definitely something I would recommend to anybody that is looking to play with digital voice modes locally as it is such a simple way to get in to it. Needless to say, I am probably quite the amateur amateur out there. Sure, I’ve been licensed 6 year, and I enjoy Ham Radio Contesting quite a lot, but I never seem to be the slightest bit prepared, and when I try to be, that’s when things go drastically wrong. This year, I was going to be ready. I was going to be prepared. I was going to get the car ready a full day in advance for my rover station to rack up the contacts, and place well, and bring back a whole load of points for the Rochester VHF Group. At least… that was my mindset last June. As time ticked down to the contest, things went south quick. In April the vehicle that I’ve had for the past [going on] four years, and the one that I’m used to loading out for the contests, decided to have a frame blowout, leaving me to have to rethink a few things for contest time. Thankfully I was able to borrow a similar vehicle from the fam, leading me to be able to retain my usual system, in fact making getting in and out of the vehicle for microwave contacts a little easier. However I did learn a few lessons this June that I should not have had to learn this way, and that should be been common sense things to know before heading out. Lesson 1: No matter how closely you follow the design specs on building an antenna, ALWAYS test the SWR before you head out on the road. Lesson 2: Even if you use it every week, your dipole may perform more poorly under improved conditions. Lesson 3: Just because you think it’s going to perform the same, doesn’t mean that it is going to perform the same. June and January are two VERY DIFFERENT beasts. Let me start with my setup. It’s not pretty. In fact, the last few years in being involved with this, I mildly pride myself on how ugly and cheap it is. A hitch mount mast holder, designed for Flag Pole Usage, Military Surplus Aluminum Mast, Moxon Design Wire Antennas in a PVC Enclosure for 2m, 220mhz, and 70cm, and LOTS of Gorilla Tape. B) If anything, it’s proof that anybody, with the right motivation and effort in this hobby can get on the air, contest, and not do too badly. C) I started participating in this contest my Junior Year of College. I was broke. Still not rolling in the dough, but I can at least swing the gas to rove without pulling in overtime two weeks before. That being said, even after spending $120 on a decent 14 el Cushcraft beam before last contest, I crushed it with contacts off this Moxon in the January contest, why bother going through all the effort of assembling and disassembling the antenna before stops if I can leave this little guy up the whole time, and STILL make the same amount of contacts? 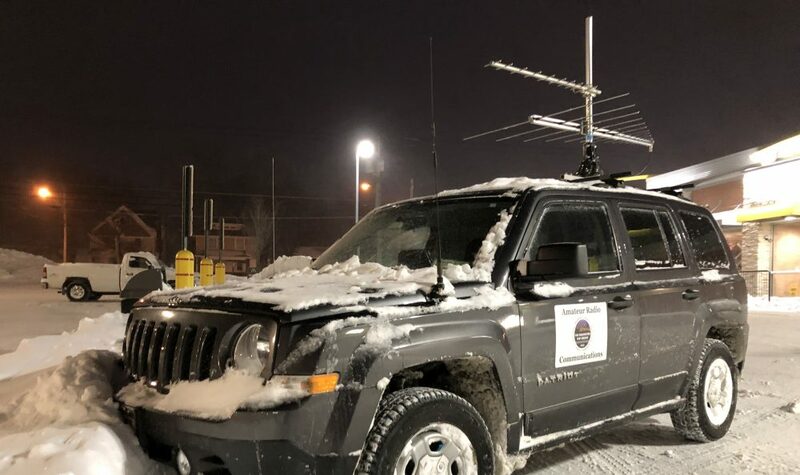 I don’t own anything that goes above 1296 myself, however another local rover and fellow club member has been pushing to get more people on the microwaves, therefore he will lend us equipment before the contest starts to aid us in that effort… I’ll tell you, it’s sparked my interest! An SG Labs 2304 Transverter powered by a RadioShack battery, and Driven by a Baofeng UV-5RA, and a small, handheld parabolic dish for an antenna making contacts from Attica, NY into Canada!? Sign me up, doc! The fact of this contest was that I was going to beat my January Score. I knew it going in. I built up an awesome 6m Moxon the week of the contest, sure, it was completely untested, but it was going to work! January I didn’t have anything for 6m, I couldn’t even get a dipole working, so I simply threw on a dummy load if I knew the contact was close enough, but I had over 100 contacts on the other bands, so I was set, convinced that this was going to work. Of course, knowing how Murphy’s Law always applies to things that I do, I decided to throw the 6m Dipole that I had strung in my attic, and used weekly for a local net, as well as for a little FT-8 Usage, into my car, just in case. I also had been using the 2m Moxon for years now, and that nice Cushcraft I bought last year was just too much of a hassle, and I wasn’t using my vehicle, so transporting it could be difficult, as I didn’t want to scratch up a vehicle that wasn’t mine… so I stuck with the Moxon. I get to my first location, grid FN02VU in Attica, and finally get setup, decide to check the SWR on 6 as it’s a new antenna, key up the radio… shuts. down. It’s a good thing I wasn’t transmitting with the sheer volume (both dB wise, and quantity) of expletives released at that moment. This is when I was questioning every fiber of my being. Why didn’t I test the moxon before I left? Better yet, why in the world did I place this PVC cement on the joints before I tested it!? This was likely the most stupid thing I have done in the 6 years I’ve been licensed. But prepared me decided to grab the dipole out of my attic, right? So I put that up, power is still turned down to about 2 watts. Tunes fine. Inch it up, 20 watts, fine, 30 watts, 2.8:1… oh… great… 40 watts? Radio shuts off. Which is a great feature in the Icom 7100 that it does that if too much power is reflected. Beats blowing up any day for sure. But where does this leave me? Only slightly better than January. Really Low Power on 6m. Who even knows if I’m actually resonating? Whatever. 6m isn’t open anyways, the contest started at 2pm, it’s now 4:15pm, and I’m not on the air yet, everything else is good, lets get it. I fire up the radios, and I’m good from 6 (on LP) to 5g. Setup the Voice Keyer on the 7100, and get on 144.215. Verify the frequency isn’t in use, and start calling CQ. Contacts slowly trickle in. I hear something come up in the band… a 4 call, and a 1 call. They were even oriented off the front of my antenna, they should have heard me, why weren’t they hearing me!? The freaking moxon. Why didn’t I opt for more gain!? Well, but in January I worked everyone just fine… because there weren’t any openings beyond FN01. End the night around 10pm with 50 or so contacts. In the morning I get setup in FN13 with a clear view SW, perfect! I work other stations up to 2304 no problem, 6m is still shot, but I really don’t care at this point, I’m still working other local stations on 6 with no problem, but just as I’m packing up to meet up with our club to do our “Rover Blitz” Lunch, 6m opens WIDE! Calling and Calling and Calling… nothing. Just like when the initial antenna wouldn’t tune, I let out a line of cursing. I pack it up, and go to lunch. I logged about 32 contacts from there, again, stark-raving mad about how open 6m is, and I, yet again, have screwed myself over on the band. A total of 7 stations show up for lunch, now, we aren’t a large club.. We’re not racking up 100,000 points each from this grid circle, we aren’t coordinating with other stations to call us, we’re just a small group, some of us are even simply submitting check logs to give the actual rovers points, and their additional contacts aren’t even helping the club. We do our quick little grid circle after grabbing a bite to eat, a grand total of an hour, with every station loaded out from 6 to 1296. We get our points, and move on. From there, I move to FN03, stopping at GCC in Batavia. It has a fairly decent view to the east, making me able to work the fellow RVHFG members without any issues from 6 to 1296. Before I even get setup, I happen to catch another rover station just as he’s getting ready to pull out and hit a new grid, we quickly sked across the parking lot, running all bands, 6 to 5g. Once I finally figured out how to tune him in on 5g that is. From there I got myself up over 100 contacts (barely), but the high bands were dead because of how open 6 was. I worked the LIM group in FN12 on a couple bands, caught a few rovers, and a few locals, but that was it. I threw in the towel, broke my station down, and called it another June VHF Contest in the books. While I didn’t get the 6m openings, or any of that 2m DX that opened up, I’ll gladly take my score just over 28,000. It’s my best June score yet, in fact the first year I roved I forgot to submit my log and wasn’t even bothered by it because of how few contacts there were, but the last two years with only 4k and 6k respectively, this is an immense change. It has also put me in a new category however, removing me from the Limited Rover category into the Classic Rover category by adding 222, 902, and 1296. This June convinced me that it’s time to make some upgrades to antennas. I want to be able to catch that DX on 2m next time I hear it, no I’m not going to venture out of the LP category, I don’t want to amplify my station at all actually. More power out = needing more power locally to run it, and I’m simply running powerpoles from the car battery for this setup, and I kind of like it that way for now. Eventually I will be transitioning over to a solar powered station for this, but that is a few years down the line yet. For now, it’s time to find a new vehicle, new antennas, and new bands. Follow up: Upon writing, and discussion, the odds are the 6m issue was less of an SWR problem (though it was higher), and more of an issue of RF. I should have choked the antenna, and the whole problem could have been averted. Lessons learned for next time.